Parents had an extended nervous wait to find out which primary schools their children would be going to. Parents have spoken of their stress and frustration after an online council blunder left them unable to find out which primary schools their children had been allocated. 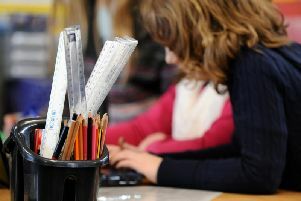 Leeds City Council ended up issuing an apology to parents and carers this morning after routine website maintenance was carried out in the early hours - at the same time parents were being told to access an online link with the information they had spent weeks waiting for. Helen Whitehead, 35, of Royston Hill, East Ardsley was desperate to know if the school place she wanted for her son Sonny, four, had been approved and was up at 3am today (Tuesday) and tried several times to use the link but to no avail. She said: "When I was waiting to find out last time when it was for my daughter, who is now six, I don't recall having to click on a link and entering a username and a password, I just remember getting a letter confirming what place we had got. Continuously clicking and getting nowhere is frustrating.The site kept searching and I could not get on, I tried for about half an hour. I eventually got on at 7am." Charlotte Francis had been checking since 2.15am and said: "This is so important to so many people and totally unacceptable." The council's website stated parents would receive their offer letter as an email attachment. Instead they were sent a link to an online portal they could not log in to. Hundreds of comments on the council's social media stated people were unable to find out which school their child had been offered a place at. The council said that its digital and information service carry out regular updates of thousands of computer servers to protect them from cyber-attack and that this means servers are out of action so it is done out of hours to avoid disruption. However, it was not due to have happened at this time due to the school places being announced. Steve Walker, director of children and families said: “I would like to apologise for the fact that some parents were unable to access the online portal for primary school admissions this morning. I have looked into this issue and it would appear that maintenance was carried out on the computer servers that underpin the schools portal. “This maintenance should not have taken place on these servers during such an important time for parents, and I can only apologise for the frustration and inconvenience this has caused." Mr Walker added that the authority had monitored the website throughout the day to make sure all parents could access the information they needed. In the end Mrs Whitehead had been allocated Hill Top Primary at East Ardsley where Sonny's sister Maeve already goes and said it was a relief to finally find out. She said: "It was a nervous wait as because we are not in the catchment area it was not a given that we would get a place. I was really anxious to find out as the dilemma of having to drop both of them off at different schools was a very real possibility."